579 records – page 1 of 29. 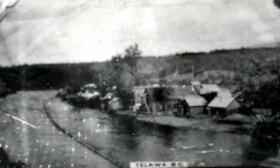 1 photograph: b&w; 17 x 10.5 cm The Telkwa Baseball team of 1911. 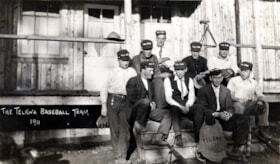 All nine men unidentified. Hiker looking up at a bear on a rockface. 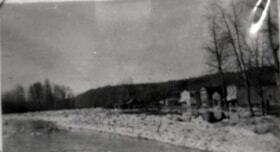 Aldermere existed from 1905 to 1915. John Dorsey staked the claim. 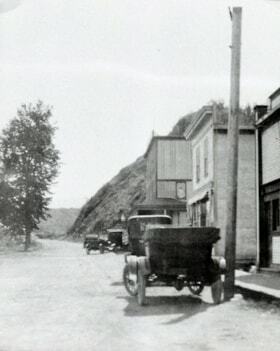 The General store was owned by J.J. McNeill and Lem Broughton. 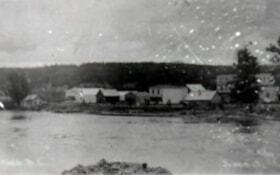 McNeill also owned the old (pictured here) and new Telkwa Hotels. 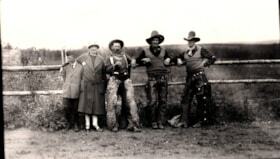 Mrs. Fisher with a boy and three cowboys at the Telkwa Barbecue. Title based on photograph contents and information from the donor. 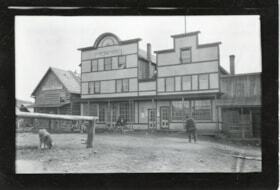 Photograph is a print created by the Bulkley Valley Museum. Title based on photograph contents and information written on the back. One of the photographs is a print created by the Bulkley Valley Museum. 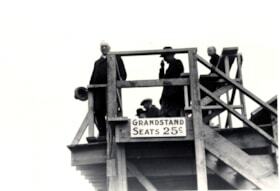 Title based on photograph caption. 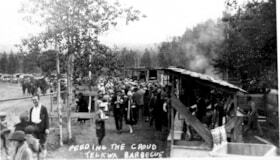 Beef barbequing was done by Harry Beck. Pits were dug and lined with rocks. 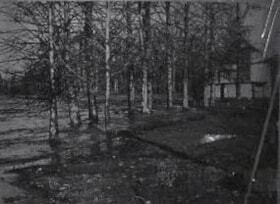 Fires were built over the pits on sheets of galvanized iron. These fires burnt all day long, then the hot ashes were shoveled from the sheets and beef was placed on them. 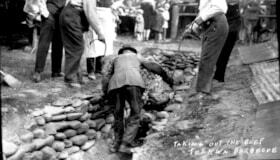 The beef was lowered into the pits and then covered with another sheet of iron which was in turn covered with the red hot ashes from the fires. The beef cooked all night long. 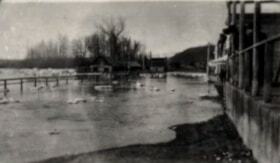 Historical information from the book Rubber Boots, pp. 52-54. 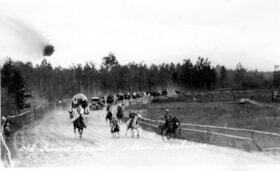 Title based on photograph contents. Title based on photograph contents and info on the back of photo. 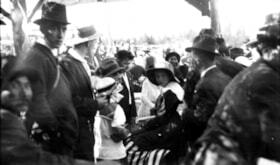 The barbeque was held on Labour day of every year and was started in 1914 by Jack McNeil. 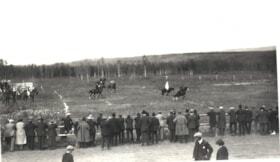 There were many events, including horse races, a rodeo, a dance. Barbequed beef was served. and the Wetzin'kwa Community Forest Corporation.